In JUMP•CUT, the follow-up to the authors’ acclaimed Make the Cut, leading film/TV editors and industry veterans Lori Jane Coleman ACE and Diana Friedberg ACE offer editing techniques, insider tips and unwritten rules that contribute to making a great production. They provide both seasoned and aspiring editors with the tools needed to jump•start the next stage of their editing careers, or to break into this challenging industry. Using a mix of practical techniques and career-focused advice, JUMP•CUT covers best practices for editing dramatic motion pictures, episodic television, documentaries and reality TV, taking into account music, sound effects, and dialog. The book is rounded out by interviews with many leading Hollywood editors, including Alan Heim ACE, Michael Tronick ACE and Mary Jo Markey ACE, who share their years of experience and unique paths through the industry. "JUMP•CUT is….The absolute best book on becoming an editor I have ever seen; it felt as though I were reliving experiences I've had with my own assistants over the years. The editing insights are heartfelt and laid out beautifully, I recommend reading it over and over. Lori and Diana have given aspiring editors an amazing gift." 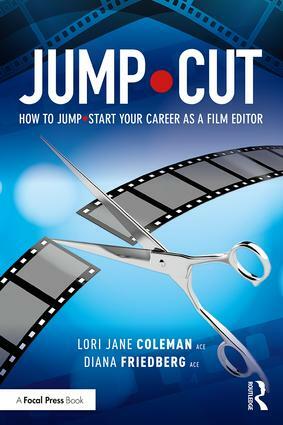 "Lori Jane Coleman and Diana Friedberg's book, JUMP•CUT, is the definitive guide to nurturing and navigating a career in film editing. Combining technical and aesthetic aspects, JUMP•CUT is filled with practical real world advice from some of Hollywood's finest editors. The book is comprehensive and best of all, it is written from the heart. Aspiring editors are extremely lucky to have the advantage of this book and its wisdom, as they embark on their careers. Absolutely indispensable!" "JUMP•CUT is a book every assistant should read when deciding to be an editor. It is easy to read, entertaining, informative and filled with detailed information that only someone who has been in the trenches would know. I even learned a few tricks. It gives good sound advice regarding the politics of the cutting room. I wish I had this book when I was starting out." "JUMP•CUT covers everything. It talks about character editing, manipulating the eye, and shaping story, as well as some of the unwritten and malleable rules of the editing room. It is an honest, practical and wonderful book about moving along your path to a fulfilling career. By far the question I get asked the most is how to get a job. The second is how to move up from assistant to editor. Coleman and Friedberg's previous book, Make the Cut, ably answered the first question. JUMP•CUT answers the second." "JUMP•CUT is filled with inspiration and education for any assistant editor who want to move up to the editor's chair." "Depending on your interests and area of creative focus different books will appeal, but pretty much every aspiring editor, assistant editor and working editor should run out and buy Jump Cut – How to Jump Start Your Career as a Film Editor. (…) They are expert guides that anyone looking for career advancement should listen to!" Lori Jane Coleman ACE was born in New York City and is a third generation filmmaker. She has been a film editor in Hollywood for forty-three years in features, movies of the week, mini-series and episodic television. A recipient of two ACE Eddie Awards and one Emmy nomination, she has lectured at multiple universities in America and been the Director of the American Cinema Editors Internship Program for twenty years. She has two daughters, Deirdre and Allison. Lori Jane and her fiancé, Scott, live in Incline Village, Lake Tahoe. Coleman was the recipient of the prestigious American Cinema Editors Heritage Award for 2017. Diana Friedberg ACE is a multiple award-winning editor and producer. In 1967 she began her career in South Africa and moved to Hollywood with her family in the 1980s. With an MFA from USC in film production, she has edited and produced features, episodic television, animation series and non-fiction productions for companies as diverse as Disney, National Geographic, Stephen J. Cannell and Leonard Nimoy Productions. During the span of her five-decade career, she has worked on many groundbreaking documentaries for television and other markets. Friedberg was the recipient of the prestigious American Cinema Editors Heritage Award for 2017.